70680 was the set which was rumored to be the Fire Temple, the small set leaked today is 70680. So there's still a chance we could get the Fire Temple but everything we've known about it up to this point was wrong. So another set leaked, it's a $10 set which is extremely similar to Spinjitzu Training from the Ninjago Movie. It comes with Kai and Nya, looks like it will be able to go with the monastery. I don't have the original for some of these either, the problem for me is you have an opportunity to take something which people already liked and do it better, but in a lot of cases they didn't (Samurai Mech is an extreme example). I wouldn't say any of the sets are bad though, but they aren't as good as we know they can be which is kinda frustrating. Earth Driller and the Monastery are the only ones which feels like real upgrades from the original, maybe the storm fighter to. Everything else looks worse or on par with the original. Suits are interesting, they seem to try to take designs from previous suits and mash them together, Jay's especially looks like the rebooted suit but with the dx dragon. Did people really care that much about the hoods, the designs is a constant complaint I've seen but I've never seen anything about the hoods. I don't like that they're seemingly moving Nya back to the dark red. The gunmetal was a lot better, it made her far more distinguishable from the other ninja. Different realm, different rules I suppose. Finally got around to purchasing the Defense on Crait set among all this solo hype. It's a little pricey, although I did get on sale, the ski speeder built is phenomenal, great detailing all around, only complaint I have with it is I wish it had some retractable landing gear or stand to fully display it with the monoski. Views. Do you think lego will go back and some sets based on past movies? Now would be a good time considering there's a sizeable gap between AM&TW and Captain Marvel. Anyone know how many pieces the Oni Titan will have? Part increase means nothing to me, they are basically airjitzu flyers. They should be priced the same. They are meant to be starter sets for kids, but why would any kid want to buy these when for $5 more they could get a $20 set. 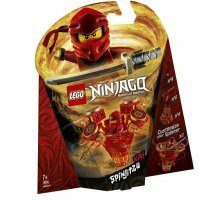 I doubt parents will want to buy them either when they could buy spinjitzu master sets for $5 less, which to most parents would probably look like the same thing. Back to the summer sets for a second, the new villain minifig looks great, as well as the weapons, I'm excited to see what else they have in store. I just got the Tech Wizard Showdown yesterday, box art doesn't do it justice. It's quite a great set, interesting concept and a great execution of it.